In a new book, published June 4, journalist author Lauren Kessler uses herself as a “guinea pig” to explore in depth the world of anti-aging: from serious scientific studies, to medical information, to facts about the enormous for-profit anti-aging industry targeted toward baby boomers, to cosmetic surgery approaches and even quackery, and back to effective lifestyle changes that all of us can make that really can slow the pace of aging. Her big finding is that scientists agree, fully 70% of the aging process (the part that controls the pace at which we age) is affected by lifestyle factors within our control. 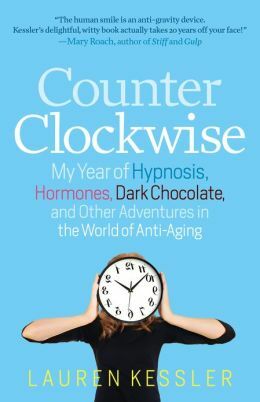 In Counter Clockwise: My Year of Hypnosis, Hormones, Dark Chocolate, and Other Adventures in the World of Anti-aging, with a sense of humor and adventure, the author takes us with her on her yearlong discovery journey through the world of the anti-aging movement, as well as an exploration of the science and biology of aging. She meets with scientists at the University of North Carolina specializing in digitally simulating the aging of faces and obtains a likeness of her own projected aged face; visits plastic surgeons and others involved in botox and other cosmetics of aging (though declines plastic surgery); has a physical exam including checks of blood pressure, cholesterol, stamina, flexibility, and oxygen-using ability; and then allows a researcher to take a biopsy of her mitochondria (muscle cell components that typically degenerate with age) to determine her real biological age (as opposed to her chronological age in years). These findings lead her on a quest to make the healthy lifestyle changes that she learns can improve her chances of slowing the pace, if not the fact, of her aging. The main — and very hopeful — message of the book is that scientists agree, fully 70% of the processes of aging (the “secondary aging processes” that control the pace at which we age) are affected by lifestyle factors within our control. The other 30% of the aging processes (the “primary aging processes” having to do with cell self-destruction, muscle degeneration, and the break-down of other physical systems) are genetic and biological, and not within our control. Ms. Kessler devotes a portion of her text to reporting, in plain and accessible language, the findings of serious researchers of the aging process, and recommending serious and classic, science-based books on aging that she found helpful. She also provides facts and statistics about the extent of the very large, and profitable anti-aging industry — projected to be a $292 Billion marketplace by 2015, according to an AARP report she sites — an industry filled with products and services targeted toward the aging baby boom generation. But, the hopeful organizing discovery of her quest, is the science-based finding she sites that “Yes, every day you get older. But the pace at which you grow older varies enormously.” “What is possible if we get serious about that 70 percent of secondary aging that is within our control?” she asks in the introduction to her book. Ms. Kessler devotes much of her year of exploration to finding and implementing the lifestyle changes that may affect the 70% of aging processes within our control. She embarks on a campaign to lose weight and maintain a healthy diet, loading up with berries, salmon, veggies, antioxidant-rich nutrients, and other healthy foods; explores vitamins and supplements; lifts weights, runs races, and exercises with high intensity to optimize fitness. After all this, Ms. Kessler reveals that she did improve enough in some objective, physical measures of biological age to support a finding that her biological age was indeed several years younger than her chronological age — which she does not reveal, but some reviewers have placed at approximately 60.